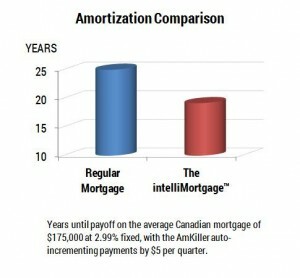 The intelliMortgage brand mortgage is the only one in Canada with the patent pending AmKiller (short for “amortization killer”). AmKiller is a fast and easy way to hammer down your mortgage balance quicker. It essentially slashes a homeowner’s effective amortization by automatically increasing their payments in tiny amounts, at the borrower’s preferred frequency. The key to AmKiller is its automation. No longer do borrowers need the discipline to make systematic prepayments. Payments automatically ratchet higher in small amounts that you control, but which are calculated for you by the system. It’s truly a “set and forget” system, albeit you’re notified each time the payment changes so you know how much will come out of your bank account. If you have a fixed rate, you can freeze your payments at any time. A modest payment increase of even $5 per quarter will shave up to five to six years off the life of a mortgage, depending on your mortgage size. You can set AmKiller to increment your payments quarterly, semi-annually or annually, in either dollar or percentage terms (up to 100% of your original payment amount). For more information, email or call us anytime at 1-800-280-2460.